The twin rath yatras beginning from Thursday this week, led by BJP President Rajnath Singh and leader of Opposition in the Lok Sabha L. K. Advani, have put the 25-year-old party in a state of disarray as serious differences exist between the top leaders over the utility of such a venture at this point of time. As he prepares to embark on his sixth political yatra, senior BJP leader L.K. Advani is keen about a change in his party’s image and does not see any immediate realignment of political forces after the coming Assembly elections. The otherwise politically cornered RJD supremo Lalu Prasad Yadav is now going out in full steam to dub the defeat of the LJP candidate Ranjan Yadav in the sixth seat in the Rajya Sabha elections held on March 29 against his party’s second candidate Rajniti Prasad as the beginning of the end of the NDA rule in Bihar. Warning JD(U) workers not to rest on the laurels of victory in the Bihar assembly poll, Chief Minister Nitish Kumar today said the people had voted for NDA to bring the state back to progress and if found wanting "they will show us the door." Elected representative, ministers and politicians in the country are expected not to have more than two issues to uphold the national population policy Chief Minister Nitish Kumar said here on Thursday. Chief Minister Nitish Kumar has taken exception to the alleged lackadaisical attitude of some officials to maintain a proper vigil on the jail inmates in Bihar. The recent incident where the DSP(Town) of Nawada, Mr Mithilesh Kumar, was threatened over phone from the Nawada jail by a criminal has caught the administration on wrong foot. The Indian Institute of Management-Ahmedabad (IIM-A) today raised its annual fee for the two-year post-graduate programme from Rs 1.58 lakh to Rs 1.77 lakh and announced launch of three separate programmes in Singapore, Dubai and Muscat. The police will conduct an identification parade tomorrow of Sunny Rawat, accused of murdering Meher Bhargava on February 28. According to police sources, the parade will take place at the district jail here, where Sunny is presently lodged. Ganga Prasad, driver of Meher, who is the prime witness to the incident, is likely to attend the parade. Criticising the “callous” attitude of the UPA Government to pleas of the Narmada Bachao Andolan (NBA) to stop construction work on the Sardar Sarovar Dam, NBA convenor Medha Patkar today said the time had come to launch a ‘’decisive struggle to achieve our objectives’’. The Gana Mukti Parishad, a people’s forum for freedom, has asked the Election Commission to withdraw state employees and the police engaged in election duty in the state and replace them with government employees from other states and Central paramilitary forces for the forthcoming Assembly poll. In an ashram school run by the State Tribal Department in Male Ghat, Maharashtra, there is no woman teacher and in the absence of a female in charge, male teachers stay with girls during the night. Union Minister of State for Home Sriprakash Jaiswal today said fencing along the Indo-Pak and Indo-Bangladesh border would be completed soon to put an end to infiltration activities in the country. Stamped eggs sold in Nagpur. Wedding bells ring for a special couple. Big B shooting for Bhojpuri film. Though former Prime Minister Atal Bihari Vajpayee has directly avoided a comment on the 'Bharat Suraksha Yatras', sources said the veteran leader was not particularly enamoured of Mr Advani's pet mission to revive the sagging popularity of the saffron party. But the onus for the unenviable position, which the BJP now finds itself in, lies on Advani and company as the twin yatras were announced in the wake of the bomb blasts in the holy city of Varanasi last month. Mr Advani had announced on March 8 that he, along with the BJP President, would undertake national integration yatras. Two words "minorityism" and "minority appeasement", used by the BJP to create feeling of insecurity among the vulnerable sections of the majority community, have become an entrapment for the saffron parivar, a senior leader said on conditions of anonymity. In the immediate wake of Varansi bomb blasts, Mr Advani thought that time was ripe for exploiting anti-minority sentiments of the majority community and announced the twin yatras without broad consultations with other leaders of the party. As a result, barring former party president M. Venkaiah Naidu, BJP Vice-President Mukhtar Abbas Naqvi, General-Secretary Ananth Kumar, Prakash Javdekar and Vijay Goel, no other leader is involved either in the planning or the execution of rath yatras which are no more called national integration yatras but 'Bharat Suraksha yatras'. "Where are Pramod Mahajan, Arun Jaitely and Sushma Swaraj who used to call shots in earlier rath yatras of Mr Advani," a senior leader observed pointing to lack of enthusiasm among the party cadres and state leaders . Undoubtedly, proper care has been taken as the yatras are beginning on April 6 which is not only the party's founding day but the day of Ramnaumi also. The twin yatras are ending on May 10 — a day when first shot was fired to start the first war of Indian Independence in 1857. But mere "symbolism" was not going to create an impact as the national mood was against this kind of politics of the late 80s and 90s of the last century, a party leader said. He said that results of Assembly elections in Assam would be an eye opener to the BJP leadership where the vote percentage of the party should go up if not seats. On the one hand, expelled leader Uma Bharti was wooing and sure to take away the traditional voters of the BJP, the party leadership under Mr Advani and Mr Singh was at loss to give direction to the party, a young leader pointed out. In a relaxed mood ahead of his gruelling more than a month-long “Bharat suraksha yatra”, the 78-year-old Leader of the Opposition was unsparing in his criticism of the UPA coalition, especially what he saw as its “minority appeasement” policies. He was, however, skeptical about mid-term elections to the Lok Sabha or about the revival of the Third Front disturbing the current bipolar polity. He admitted that the Sangh Parivar units like the VHP were “not enthusiastic” about him but it did not hurt him. Speaking about his controversial Pakistan tour and reports that he was keen on an image makeover there, he blamed the media for interpreting his Jinnah remarks as a conscious effort to change his image. “I continue to be what I am and I have always been. I would like the party’s image to change. There is a wide dissonance between the party’s reality and its image. After my resignation from the party presidentship, I said I feel sad that my party lost an opportunity,” he said. Asked about the party’s efforts to adopt a Centrist approach when it was in power and its present dilemma when out of power and what it should do ideologically, Mr Advani shot back: “These are all very often simplistic journalistic comments”. When queried whether Congress President Sonia Gandhi’s resignation could be exploited by her for electoral gains in the near future, the former Deputy Prime Minister ticked off the suggestion saying that “people are mature enough to see through all this”. The immediate provocation for Mr Lalu Prasad to derive such conclusion stems from the fact that the NDA pledged its support to the LJP in the sixth seat which was an open one as neither the RJD nor the LJP had the required 35 first preference votes on their own strength to bag the seat. But despite the failure of the NDA to get Mr Ranjan Yadav elected, mainly due to massive cross-voting by Independent MLAs, Chief Minister Nitish Kumar perhaps scored a moral victory over Mr Lalu Prasad. It is Mr Kumar`s promise to uphold value-based politics and accountability which helped him to win the people’s mandate in the October-November polls to bring an end to the 15 years of RJD rule in the state. Mr Kumar’s decision to stick to the same value-based politics, however, reportedly cost him dear in the Rajya Sabha elections as he refused to oblige some Independent MLAs with ‘‘some extra favour’’ in violation of administrative transparency against their promise to cast their votes in favour of the LJP. Sources close to the NDA, which was confirmed by a senior leader of the RJD too on condition of anonymity, disclosed that a section of Independents, who had betrayed the NDA, were unhappy as Mr. Kumar refused to pay heed to their request seeking favourable posting of block level administrative or police officer. ‘‘This was primarily because Mr Kumar was committed to offer a clean administration to the people’’, sources claimed. It was learnt that for those Independents, who had helped the RJD Government to continue in office for five years between 2001-05 despite its failure to get absolute majority, it was not at all a problem to have favourable police or administrative official at the block and district level during the earlier regime. Another interesting revelation is the fact that out of the six Independents, of the total 10 who had changed sides, four of them reportedly did so by taking the caste factor into consideration also. The state JD(U) President Rajiv Ranjan Singh a couple of days before the Rajya Sabha elections said all the surplus MLAs of the NDA and 11 Independents would vote for the LJP. But the JD(U) leadership then had little idea that a section of Independents did not like the value-based politics based on accountability being preached by Mr Nitish Kumar who did not even consider minor transfer or positing to suit their requirements at the local level. Mr Kumar’s seriousness to help the LJP was evident from the fact that the NDA had identified six of its own MLAs to vote for the LJP, and in turn had banked on six Independents to get its own candidate Ali Anwar elected. It was learnt that after the NDA realised that all those six Independents had crossed the floor despite promising to support its candidate Ali Anwar, the NDA had to go for a damage control exercise to save Mr Anwar, leading to the defeat of Mr Ranjan Yadav. The victory of the second RJD candidate Rajniti Prasad may have proved that nobody was as adept as Mr Lalu Prasad in political manipulations and vote managing skills, but Mr Kumar was reportedly satisfied that even in the face of such an embarrassing situation, he did not compromise with his commitment to morality in politics. But despite the victory of the RJD’s Rajniti Prasad, there is an alarming signal for Mr Lalu Prasad. The 23 votes polled by Ranjan Yadav included that of the CPI, the NCP and the SP, which clearly indicated the emergence of a third force in state politics. "The result of the Assembly polls in February last year which threw up a hung Assembly and was subsequently declared null and void was a negative vote meant to oust the RJD from power. But the people gave a positive vote in October-November polls reposing hope in the NDA to bring back the old glory and progress in Bihar. "The positive vote is loaded with a lot of expectations of the common people. 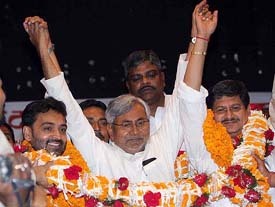 There is no time for us to rest on our laurels (winning the election)," he said at the JD(U) state council meeting here. Mr Kumar, who is also chairman of NDA in the state, asked the party to work in tandem with the government to fulfil its promises to the people. The Chief Minister, who was authorised by the JD(U) leaders to choose state party president and principal general secretary, announced re-election of Rajiv Ranjan Singh, alias Lallan Singh, MP and Upendra Kushwaha to the posts, respectively. Listing the achievements of his four-month-old NDA government, he said the biggest accomplishment was a "total turnaround in the environment". "Bihar is no longer a bad name for outsiders. There is no more hesitation among people to come to the state as was manifested by large number of proposals coming for investment in different sectors," he said. Stating that his government's ambition was to make Bihar a model state, he said reservation of 50 per cent of seats for the women in its panchayats was a historic step which other states would be forced to follow soon. Besides, it was the only state where all its districts have been covered by rural employment guarantee schemes. While 23 districts were covered under the Centres NREG schemes, the rest have been brought under the fold of the one drawn up by the state government. Highlighting steps by his government in the fields of education, power, health and road construction, he appealed to the party workers to lend a helping hand by making people aware of its policies and by providing the peoples' feed back. Mr Kumar was inaugurating a workshop on Reproductive and Child Health (RCH) Scenario in Bihar organised by Population Foundation of India (PFI). Mr Kumar favoured laws at national level to monitor the implementaion of the national population policy, comprising both incentives and deterrents.”Politicians often evade addressing the issue of population boom derailing all developmental efforts.This is not right”, he observed. 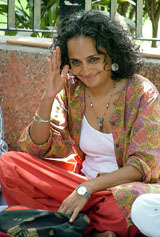 The executive director of the Population Foundation of India A.R. Nanda said that the population in India, which was little more than 100 crore now, could stabilise by 2050 only if population boom in Bihar and UP were checked effectively through family planning and other measures.”The average issues to married couple in Bihar and UP is between four to five”, he said adding the need to raise social awareness to check the trend. Mr Kumar agreed to the views expressed by Mr. Nanda and advocated pro-active public-private partnership betwen government and NGOs to carry forward the mission of population control.”The national average on many RCH related issues is often lower than the achievements of the Southern and Western states because of the poor performance of Bihar and UP”, he added. The findings by the PFI and various government agencies in terms of the RCH conditions in Bihar placed in the workshop revealed that about 58 per cent women are married in the state below the 18 years of age with current use of family planning methods as low as 24 per cent with only Uttar Pradesh lagging behind. According to Mr Nanda, the use of permanent method-female sterilisation- in Bihar is confined to only 20 per cent against all India average of 34 per cent. Raids by the police led to the recovery of pornographic film CDs, mobile chargers and cell phones after the DSP lodged a formal complaint about the threat. “The caller asked me to help in a criminal case,” he said. After the recovery of objectionable material from the jail, Nawada SP Shalin admitted that a section of officials were not taking the issue of routine checking seriously. The announcement on the 12 percent fees increase came after the board of governors of the premier institution met here under the chairmanship Infosys mentor N R Narayanamurthy and approved the measure. "The IIM-A board of directors have decided to increase the fees for the post-graduate programme (PGP) courses from Rs 1.58 lakh per annum to Rs 1.77 lakh", Mr Narayanmurthy said but assured it would not affect students from lower income groups. The hike which comes after a gap of three years will, however, not affect the students from the lower income group who come to study at the IIM-A from across the country, Mr Narayanmurthy assured in the presence of the institute's director Bakul Dholakia. Mr Narayanamurthy said the decision on the fee hike was made keeping in mind escalation of costs. "We discussed matters related to escalation of costs and consequently the board arrived at a consensus to raise the fees. This raise in fees is probably less than the annual rate of inflation," he remarked. He said the increased fees for the PGP courses was just 30 percent of the average salary bagged by IIM(A) students during annual placements. Last year, the average salary of the students passing out of IIM(A) was Rs 7.5 lakh and this it went up to Rs 10 lakh, he pointed out. Apart from the issue of fees, IIMA Director Bakul Dholakia said the B-School board approved conducting management progrmmes in Dubai and Muscat in the Middle-East. "We have entered into alliances with educational institutions in Dubai and Muscat which will be providing our faculty with the logistic and marketing support," Mr Dholakia said. He said the IIMA would be conducting 5-10 different management programmes in both these places in 2006. However, a section of the police was confident that Sachin Pahari, who was still at large even after being shot during a police encounter on Wednesday last, was the main accused in the case and the name of Sunny was dragged just out of confusion. A senior police official maintained that identification of the main accused during the parade would decide the fate of the case as another prime accused Sachin Pahari was still at large. Finger print experts had also been engaged to find out the real culprit behind the incident. Inspector General of Police (Lucknow Zone) O.P. Tripathi said here that the probe was progressing at a normal pace and now finger prints of Sachin Pahari would be examined to ascertain as to whether he was the real culprit behind the killing or not. Earlier, the driver had claimed that Sunny had pulled the trigger on Meher and the accused also had later conceded of committing the crime. Later, Sunny, retracted from his statement by saying that he had admitted of committing the crime under pressure of town police. Sunny along with Sachin Pahari was present when Meher (50), wife of Congress leader Luv Bhargava, was shot at by four persons in Lucknow on February 28. She succumbed to her injuries at Apollo Hospital in New Delhi on March 25. Pahari, along with three other persons, had shot at Meher in the busy Shahnajaf road area outside Dilip Pur Towers when she protested against their passing lewd remarks at her daughter-in-law. ‘’This is nothing but a mockery of the democracy. So the time has come to intensify our struggle for the fulfilment of our objectives,’’ she noted. Lending support to the struggle of the NBA, at a public hearing of the grievances of the Narmada oustees, were noted writer Arundhati Roy, actress Nandita Das, Gandhian Nirmala Deshpande, social activist Surendra Mohan and Professor Iftikhar Gilani. The parishad is a non-political social organisation set up by educationists and intellectuals in the city to fight against the CPM’s policies and misuse of official machinery for gaining political mileage. The president of the parisad, Prof Sunanda Sanyal, told mediapersons that they had made a formal demand in this regard to the Chief Election Commissioner, Mr B.B. Tandon, during his recent visit to the city. He felt that the step was necessary to prevent rigging at polling booths and intimidation of genuine voters by political parties. He said they had met with Mr Tandon both in Delhi and here on more than on occasion and made some formal proposals for holding free and fair elections in the state. Professor Sanyal alleged that democracy was being threatened by hooligans shielded by political parties, especially the ruling CPM, which has been in power in the state since 1977. He said they could convince the Chief Election Commissioner on the issue by producing official documents and statistics. “Accordingly, we suggested several steps for ensuring free and fair elections, to which Mr Tandon agreed,” he claimed. Professor Sanyal felt that voters needed to be cautious in exercising their franchise, and unless that happened the real verdict of the people would not be reflected in the ballot boxes. In Tabru Kheda village, also in Maharashtra, the Zila Parishad Primary School is lying closed because 50 per cent of the village population has migrated to other parts of the country due to famine. “The conditions in various zila parishad schools is same as far as staff strength, infrastructure and standard of education are concerned,” points out advocate Ashok Agarwal, adviser, Social Jurist, a lawyer’s collective that has petitioned President A.P.J. Abdul Kalam, seeking his intervention for ensuring quality education in the tribal areas of Maharashtra. The organisation, in association with volunteers from the Apeksha Homeo Society, Amravati, constituted a team of investigators who travelled across the state to report on the deplorable condition of government schools in tribal areas of Amravati district of Maharashtra. “We found ashram and zila parishad schools lacking in basic amenities. We found that children were facing health problems and there was no arrangement for any medical attention. There is a shortage of qualified teachers,” recounts Agarwal. Interacting with mediapersons here, Mr Jaiswal said once the border fencing work was completed, a comprehensive check would be put on the infiltration activities through both sensitive international borders. Infiltration has been checked considerably following fencing and stepped up vigil by security forces along the Indo-Pak border running through Jammu and Kashmir, Rajasthan and Gujarat. ''The tourist traffic in Jammu and Kashmir has increased and the influx of militants as well as drugs has been stopped in these three states neighbouring Pakistan,'' Mr Jaiswal claimed. Likewise, fencing along the Indo-Bangladesh-Myanmar border was also going on a war footing, which would resultantly check infiltration in West Bengal, Assam and Tripura, he said.